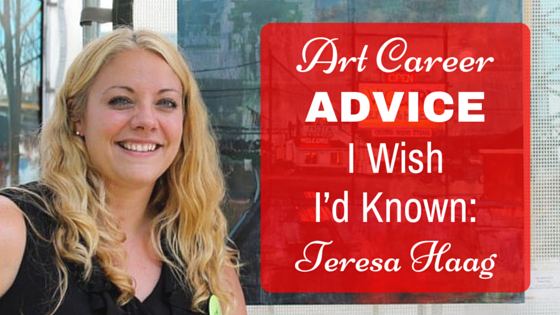 With countless art shows under her belt and an enviable number of “Best in Show”s, Artwork Archive artist Teresa Haag has much to share about being a professional and successful artist. Working for a medical company in her past life, Teresa didn’t take the traditional art school path to full-time artist. She had to trust her talents and take a leap of faith. Teresa attributes much of her success to the business and marketing skills learned during her corporate career, as well as her drive to constantly challenge herself. Lucky for us, Teresa generously shared what she’s learned over the years from a quick tax suggestion to thoughts on hiring a studio assistant. 1. The people I met after quitting my full-time job to do what I love changed my life. I have so many supporters and best friends who are artists. I have this whole new family connected by our love for art. My job was amazing and I was doing well, so when I decided it was time to become a full-time artist, I sacrificed a lot. It was hard, but it was so worth it. For anyone who’s wavering about this decision, following what you’re passionate about will bring you like-minded people who’ll support you. 3. I wish I would’ve known how much time I’d spend on admin and hired an assistant in the beginning to grow with me. Now, I’m afraid to source out help because I’m concerned about letting someone else control parts of my business. It would have been great to bring help in early on. 4. Always challenge yourself. Staying within your style and voice is great, but bringing in new mediums will only help you grow. 5. Set aside tax money before you deposit your check into your account. I cannot stress this enough. "Before the Rain Ended" by Teresa Haag. 6. It can be scary to talk about your art, but you’re not going to get better unless you do. I really dove into this by connecting with emerging artists at shows. If you get yourself out there as an emerging artist it will make it a lot easier. 7. Join an art center. It doesn’t have to be anything big, but it really helps to get involved. When I left my job to pursue art, I connected with my local art center and submitted pieces to their member show. I won and the prize was a solo show for the next year. 8. Keep a mailing list of all the people you meet. Sign up for MailChimp and let your connections know you’re still making art every week. Your customers will want to see your latest artwork and it’s the best thing you can do for your business. I wish I’d started that earlier. 9. Never stop learning. Soon after I flipped the switch to become a full-time artist, I realized that although some of the business aspects were similar to my corporate career, there were many that were not. I started following Alyson Stanfield’s Art Biz Coach blog and found her articles and tips helpful and relevant to the business of being an artist. I am now right in the middle of my third program with her and several artists from across the globe. There are opportunities for artists to learn and grow all over the place. Don’t procrastinate. Figure out what you want to improve on and go find someone who can help! In a creative rut? Try listening to these inspiring, insightful, and surprisingly humorous TED talks.